This LP is another fun oddity I pulled from a friend's collection that he was downsizing. I've had other versions of this album for quite some time. Both the full artwork LP on Toxic Shock and the original CD version on Toxic Shock that had a bunch of extra songs from 7"s that weren't on the K records reissue. 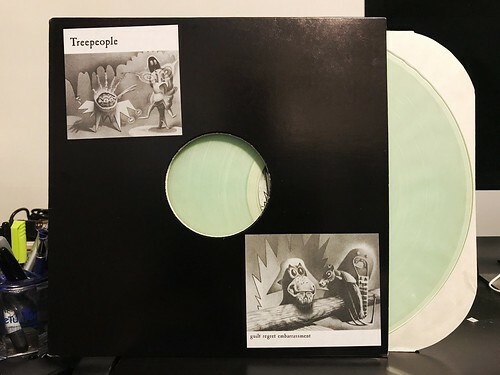 As a lot of people did, I started trying to listen to Treepeople albums because I was a big Built To Spill fan. What I've learned over the years is that Treepeople's output is more than enough to stand on its own. I could make the argument that Guilt Regret Embarrassment is the best Treepeople album. It certainly has the most upfront presence of Doug Martsch, but it also has two of my very favorite songs leading off this album. "No Doubt" into "Andy Warhol" is the sort of one-two sonic punch that other bands would kill for. Killer pop sensibilities mixed with ultra dynamic guitar work and blistering solos that never dip into feeling like self indulgent wanking. Those two songs on their own are reason enough to pick this album up, but the entire thing is packed with great songs. Even simpler, straightforward punky songs like "Transitional Devices" have a little extra something that keeps them above the fray. Just a great, great album. This particular version seems to be a promo LP of some sort. It's in a black DJ sleeve with little paper cutouts of the artwork glued on. It does come on clear vinyl, which is a nice little treat as well. I can't say I know too much about it and the internet isn't a ton of help, but it's a cool version to add to the collection. This was Toxic Shock's contractual obligation packaging, and was a first release version. A year after turning in the master tapes, the label had to publish it or lose rights to it. As the year came to an end, the label had these made with 24-hour turnaround... hence the generic 12" sleeve plus stickers!